It is quite an endeavour to make a space film in Telugu, given that interstellar explorations and achievements haven't been considered to be in our cinematic DNA for so long. And that assumption is not entirely unreasonable, since the scientists who launch rockets mostly do so by sitting behind a monitor, and the closest a film can squeeze from them in terms of dramatic action is a nervous stare. So these films mostly feature astronauts as heroes, and we partake in their adventures. However, American (sense of) pride and propaganda comes to Hollywood's rescue in giving those set-pieces a mass appeal, and here Sankalp Reddy figures out that Indian patriotism is our counterpart ingredient. But Antariksham doesn't do a stellar job at proving it. 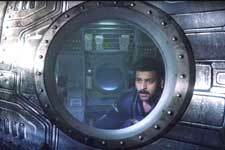 Antariksham is led by a deeply flawed protagonist Dev (Varun Tej), who infects the conflict in the story with his crippled ideology and hackneyed worldview. His character's shortcoming wouldn't have been such a gaping hole had it remained a territory explored by the drama rather than emerged as the moral centre of the whole film. Why would you allow your protagonist to hijack the moral core of your film when you have spent so much time in establishing him as a neurotic, overtly sentimental, frequently ill-tempered and impulsive brat with questionable judgement? The film could have tactfully drowned this in thrills and special effects, but unfortunately none of the set-pieces is even hardly edge-of-the-seat. An Indian satellite goes rogue in space and is well on its way to collide with other satellites, and the debris from the collision could set off a chain reaction destroying all other satellites. To prevent the impending communication blackout, the folks at Indian Space Centre (Rahman, Srinivas Avasarala and Aditi Rao Hydari) decide to bring in the only man who can prevent this disaster. Dev happens to be the only one to whom the knowledge transfer regarding the ageing satellite was given. As it turns out, he had left the team years ago, and you also learn that Riya (Aditi Rao Hydari) has a history with him. But they all have to keep that baggage aside and save the world. This film features the cheesiest of dialogues in recent times. The characters in Antariksham don't talk like everyday human beings. Every other line has to be either a platitude or a quasi-philosophical one-liner. This becomes unbearable in the flashback episode where Dev and Parvati (Lavanya Tripathi) engage in a virtual boxing match of melodramatic dialogues. It is good that psychological diabetes is not a thing, for you would otherwise surely get it by the intermission. Similarly, you are subjected to supposedly rousing patriotic speeches in the second half and all of them manage to fall flat, thanks to the unconvincing central conflict that is devoid of any urgency or emotion. Varun Tej's emoting still leaves a lot to be desired. It takes a lot more than sporting a beard to portray a man with a past. Hydari outshines him everywhere, and you only wish that her character were woven more integrally into the emotional part of the story. Yes, her rationality counters Dev's impulsiveness, but nowhere does this interplay drive the dramatic turns that the story deemed necessary. It's as if the movie decided halfway that these character explorations were too expensive in terms of time, and that half-baked feel is evident throughout. The visual effects are convincing, and the soundtrack is appropriate. The film could have used at least a couple of taut set-pieces that were well thought through. When fixing the faulty Mihira, failing which a global catastrophe is on the cards, is so well-sold, it doesn't seem to be a wise screenplay decision to forgo that midway and let an irrational endeavour of the protagonist hijack the conflict. It not only drains the tension but also suffers from not earning our approval. Nevertheless, Antariksham proves that it is not a preposterous idea to write a story based on space missions. Nowhere does the setting look silly, and none of it feels implausible. Yes, there are ample cinematic liberties taken, and not many of them pay off, but we can imagine how they could have. Sankalp Reddy doesn't boast of ambition and execution alone, he rightly understood that his story needed a human angle. However, the film shows that even that doesn't suffice. If Reddy aspires to be as dexterous as he needs to be to make a film like Antariksham work, he needs to go deeper. 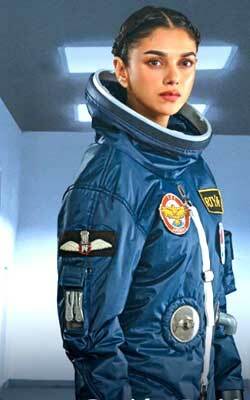 Be the first to comment on Antariksham 9000KMPH! Just use the simple form below. fullhyd.com has 700,000+ monthly visits. Tell Hyderabad what you feel about Antariksham 9000KMPH!